One ticket per person is required to enter the Piazza for all guests age 3 and older. There is ONE ticket per day. The ticket covers admission to ALL concerts for that day. Tickets can be purchased online, at retail ticket outlets, and on-site at the Ticket Booth (located near the Bocce courts). Remember, readmission is always free, pay only once per day, per person. 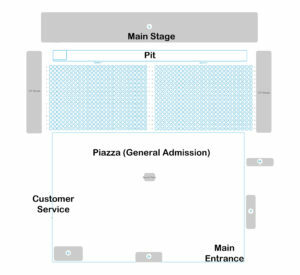 Piazza Tickets are general admission into the Piazza (see map). Picnic tables are provided, and are first come, first serve. Readmission is free with a hand stamp. Pit tickets grant access into the Pit in front of the Piazza stage (see map). The Pit is standing only, no chairs are allowed. An extremely limited number of tickets are available each night for the Pit. You may come and go from the Pit as you wish. An armband will be issued upon entry to grant you Pit access. Armbands may not be transferred. Readmission is free with your pit armband. 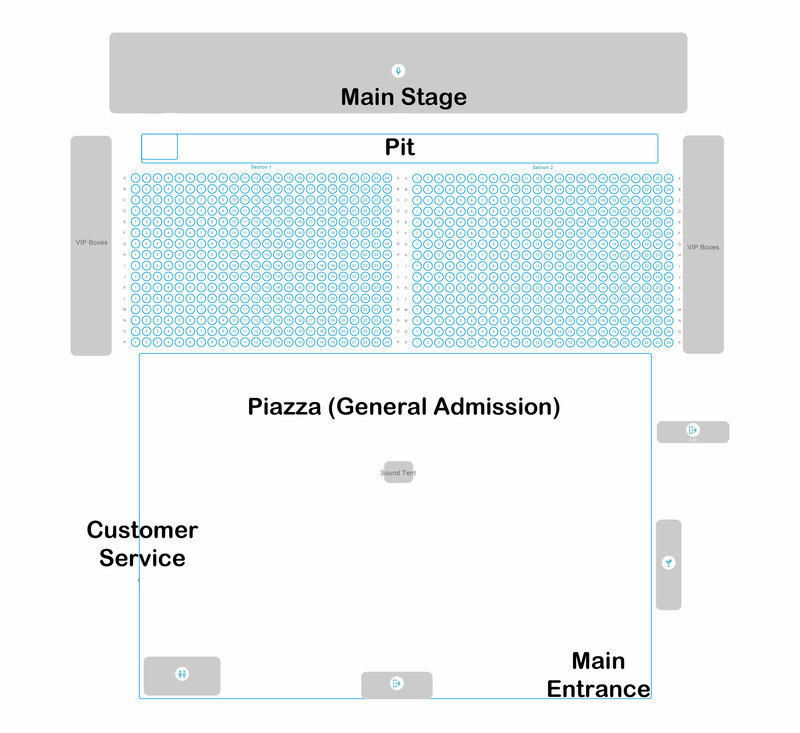 Two Premium Reserved Seating sections exist between the pit and general admission. Seats are assigned by ticket at the time of purchase. Once purchased, tickets cannot be moved or refunded. Customers may select their seats from the map during purchase when using a desktop computer, customers using mobile devices will be automatically assigned the best available seats. Readmission is free with your Premium Reserved Seating stamp. These VIP boxes are available to qualified sponsors only and hold 25 people each. If you are a sponsor and would like a VIP box, please contact your sponsor representative. Sponsor VIP box passes are not Piazza tickets, you must have a valid ticket to enter the Piazza and a valid Sponsor VIP Box pass to enter the VIP box. Guests with VIP box passes should enter at Customer Service. Add EARLY ENTRY to any ticket to enter the Piazza 30 minutes prior to opening times! One Early Entry Add-On required per ticket. Early Entry not valid as a stand-alone ticket. Guests should arrive at the main gate no later than 35 minutes prior to the Piazza opening time to be granted Early Entry. Tickets purchased online are emailed to you. You must either print out the ticket, or install Eventbrite on your smartphone and present an electronic ticket to enter the Piazza. If you do not have a paper or electronic ticket, you will not be permitted entrance into the Piazza. Each ticket is uniquely coded. Copied tickets are not valid. Only tickets from official HerrinFesta Italiana events will be honored. Guests may not bring coolers or lawn chairs into the Piazza. Alcoholic beverages may not be brought into or removed from the Piazza. Guests may bring food and non-alcoholic beverages into the Piazza. No glass bottles permitted. Food and drink are available for purchase outside the Piazza in the HerrinFesta Midway. To ensure the safety of our children, ages 12 and under will not be admitted into the Piazza area without a parent or guardian.